Back in April of 2012 Kate attended the premier of Disney's "African Cats" in a grey Matthew Williamson dress. 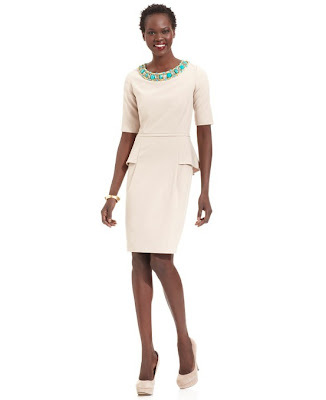 The dress has 3/4 length sleeves, a peplum detail, and turquoise embellished trim at the neckline and sleeve cuffs. I thought this was a good look for her. The length is nice and I think she looks great in peplums as they give her straight frame a bit of shape. The dress photographed beautifully and surprisingly bright even though the weather was dreary and it is a pale grey color. I also really love the contrasting pop of the bright turquoise on the trim and it definitely brightens up her face a bit. From certain angles it looked a bit big on her from the shoulders but it is nicely balanced by the peplum and you can't tell too much since she wore her hair down. The dress is from Matthew Williamson pre-fall 2012 collection and retailed for approximately £995, or about $1,500 USD. You can see that some customization was done for Kate's version as the original doesn't have the added embellishment at the neckline. This look-a-like is right on the money with its pale hue and bright trim. There are modifications such as no trim on the sleeves and a different style of peplum but over all its a pretty good repliKate. This dress retails for approximately $179 USD, currently on sale for $89.50. 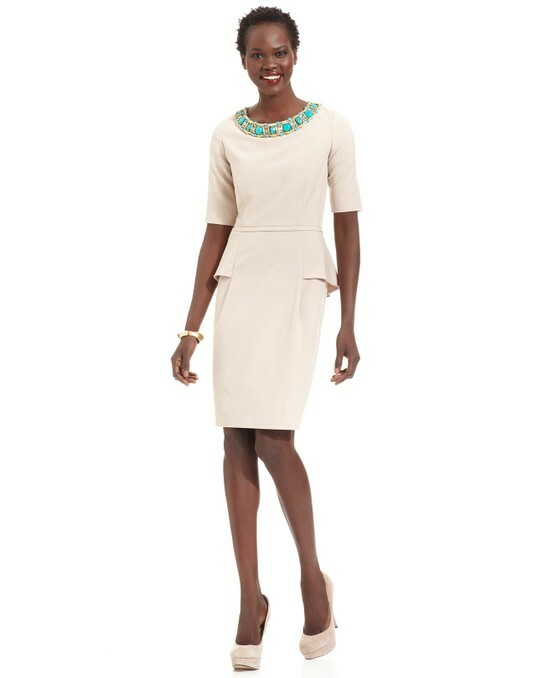 Eliza J via Macy's - beaded peplum sheath.